Ideal for landscaping and construction workers who require added toe protection, these Muck Chore Classic Series Tall Steel Toe Men's Rubber Work Boots keep feet dry and comfortable all day long. The 5 mm CR Flex-Foam build is 100% waterproof and shock-absorbent. It also retains heat and is flexible to adjust to the natural contours of the foot for good support. 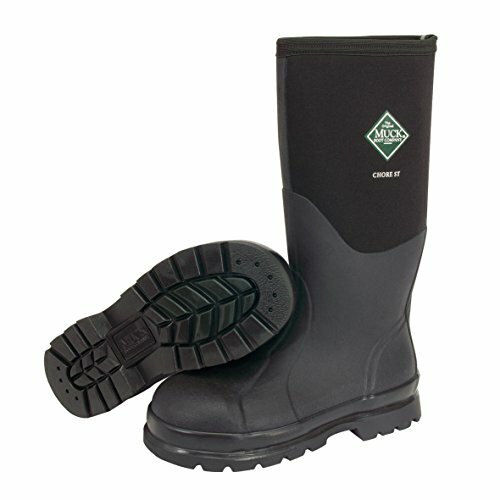 In addition to outer waterproofing, these men's safety boots keep feet dry on the inside by wicking perspiration away from the skin. Built for durability, these men's rubber work boots feature a steel toe for impact protection, a steel shank for added support, and easy-to-clean rubber overlays and outsoles.